Singapore’s population of 5.47 million people represent a thriving multiracial and multicultural nation whose pioneer generations came as immigrants in the latter part of the 19th century and after the turn of the 20th century. In the early decades, they lived in separate enclaves and held dearly to their family ties to their motherland be it India, China, or the Malay archipelago. Arab traders were also drawn to the island. At that time, they identified themselves according to their ethnic or racial groups. Today, the sense of being a Singaporean first and then an ethnic Indian, a Chinese or a Eurasian is the result of years of constant social engineering, and of conscious nation-building. The Singapore story has its moments of tensions and challenges. Singapore joined Malaysia along with Borneo and Sarawak in September 1963 in a move that signalled the end of 144 years of British rule in Singapore. On 9 August 1965, the first Prime Minister of the Federation of Malaysia, Tunku Abdul Rahman, announced that Malaysia and Singapore would go their separate ways due to differences in values. On hearing the news five decades ago, a visibly emotional Prime Minister of Singapore, Lee Kuan Yew, recalled on public TV that he had always believed that the future of both countries lay together. Malaysia’s rich hinterland was Singapore’s lifeline supplying drinking water, food, raw materials and resources as well as opportunities for trade. An island without natural resources, Singapore’s independence from Malaysia was daunting. But it made the government even more determined to succeed as a nation ± the Republic of Singapore was born. “Singapore will survive, “Prime Minister Lee declared at the time. A fractured and divided society when it separated from Malaysia, the Lee-led government then built the Singapore nation over the next few decades. With Malaysia’s rejection, Singapore was forced to quickly work on building a new identity with a population of two million people. The evolution of Singapore’s identity was shaped by a conscious decision to balance a multiracial, multireligious state in a large Muslim world in South East Asia. Statistics show that 74 percent of Singaporeans are ethnic Chinese, 13.3 percent are Malays, nine percent of Indian origin and 3.25 percent of other origins. Despite the majority Chinese population on the island, Lee Kuan Yew and the People’s Action Party (PAP) chose to build a multiracial, multi-religious nation. Singapore has always recognised the dangers involved in being a small island state in a large neighbourhood, acutely aware of the powers of the big nations that shape and influence the world – the US, Japan, China and the immediate neighbourhood. This was strongly reflected in its state policies. Lee had decided that Singapore’s identity would not be based on race, language or religion, but on fundamental values ± multi-racialism, equality, meritocracy, integrity, and rule of law. The government took tough decisions and developed a reputation for tight control. It believed that western values would not work, and it created a press that worked with the government in nation building. This expanded into a strong bureaucracy. The push was for meritocracy which resulted in a fair and just bureaucracy. The government steered the country with a unique approach of infrastructure building, emphasis on equity in terms of access to education, housing and health care, and was unabashed about launching campaigns to shape its population into a national community. These campaigns ranged from encouraging productivity, to speaking Mandarin to promoting a courteous way of life. In 1984, Prime Minister Lee acknowledged that the Singapore government’s intervention in even very personal matters was the key to the country’s success. Over the decades, as social policies evolved, Singapore’s ruling PAP simultaneously adopted what has come to be termed as “Asian values” – respect for authority with a focus on peace, security and inclusiveness in a multiracial and multireligious society. The government used various means to inculcate a sense of “Singaporeanness” among citizens. There were attempts to homogenise various cultures from attempts to design a national dress in the 1980s to the increasingly sophisticated annual national day celebrations to mark the founding of the Republic. Newly built public housing worked on a formula of having homes allotted to a mix of racial groups. Patriotic music and dance, and parades by Singaporeans from all walks of life, have become an annual ritual. Underlying it all is the presence of the defence forces through parades of tanks and military drills to fly-pasts by the air force, intended to remind Singaporeans that sovereignty and security in Asia needs to be worked at and cannot be taken for granted. Despite the Muslims being a minority in Singapore, Malay was picked as Singapore’s national language. Hence the pledge and a national anthem that emphasises unity and progress is in a language that is familiar to its neighbours – Malaysia and Indonesia. Conscious of its multiracial populace, Singapore took pains to develop a language policy that would include the promotion of Mandarin to replace the many Chinese dialects in use before the 1980s. This was done to create a more homogenised Chinese community and led to comment by other non-Chinese Singaporeans on why Mandarin needed to be promoted. The government’s response was to point to the importance of China in the coming years. And despite efforts to encourage spoken English like the British (Singapore’s colonial masters) by the late 1980s, a new patois called “Singlish” emerged (Singaporean English characterised by a particular accent and which incorporated many local languages). “Singlish” has since become a defining mark of Singapore’s identity. Singapore films and literature – primarily in the English language and some in Mandarin – emerged in the 1990s and began to reflect the issues people were concerned about – education, living in the heartland of an island state, and the aspirations of a generation of Singaporeans. The building of a nation continued with the popularisation of patriotic songs. The songs called on Singaporeans to believe in a vision for the country, alluding to what can be achieved in a community, and it promoted multiracial neighbourhoods. Advertising companies and public relations companies were consulted to hone a sense of belonging through popular media. Ask any Singaporean what Singaporean identity means and several answers will emerge. Many are uncertain about what identity means. Food is often cited – referring to the unique mix of Malay, Chinese, Indian and Peranakan food that are distinct from the food in some of the countries of origin. The compulsory National Service in the armed forces where young Singaporeans learn to defend the country is a unifying factor, although this largely applies only to the males. Yet other unifying factors are the strong sense of equity where elitism is downplayed and where Singaporeans feel that education and health should be provided for everyone. The Singapore government in the early years was guided by the principle that all Singaporeans can contribute to and benefit from the country’s development regardless of “race, religion, connections of family background” said Singapore’s president, Tony Tan who reminded Singaporeans that “… Mr Lee embedded a sense of integrity into our very identity as a nation”. And to symbolise this emphasis on honesty and integrity, the PAP chose from its early days to wear a “uniform” of white shirt and trousers at elections and state occasions. Singaporean academic and writer Cherian George refers to the conscious state crafting that has taken place over the years. This goes beyond mere economic development and embraces the need to forge a unity so necessary for peace and stability. Public diplomacy became an integral part of nation building with continued attempts to generate the sense of identity and belonging for a new generation of Singaporeans. Journalist Koh Buck Song describes the state’s effort to include public diplomacy as part of Singapore’s strategy with consistent attempts to build a Singaporean consciousness among its people. Describing nation branding as “the lifeblood of any nation”, he points out that1 branding has the potential to boost the economy, and improve the quality of life in Singapore. Koh’s analysis points to the systemic tendency in Singapore to view everything through a commercial paradigm, and the very practical perspective of economic success. David Marshall, Singapore’s former chief minister, once described Singapore as “the first country in the world whose national identity is commerce”. 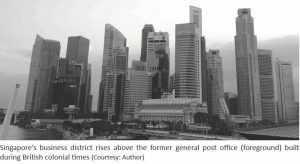 With changing times, Singapore’s vision remains the same. The population is becoming an even greater mix of cultural backgrounds with a recent immigrant wave. Of the current population, 3.8 million comprise citizens and permanent residents with residential status. The process of nation building continues as Singapore looks to the next 50 years with nearly one in three Singaporeans who are not citizens nor permanent residents. The question of identity has become, in a sense, more pronounced as the original inhabitants (the 3.3 million citizens) are now redefining themselves and their sense of identity as they encounter the “other” the permanent residents and others who have come to work or study. Singapore celebrates its 50 years of independence in August 2015. And the story is inevitably about a country that has moved from a third world situation to the first world, and from a multiracial population to one with a strong sense of Singaporean-ness. As the event draws nearer, the Singapore narrative takes on a special meaning because it will be celebrated in the aftermath of the death Singapore’s first Prime Minister, Mr Lee Kuan Yew. This end result is, in many ways, voiced by the cab driver who tells his passenger: “We’re Singaporeans, my parents were born and grew up here. I’ve never been to Kerala,” says the cabbie. “So what’s India like?” he asks. About Author: Siok Sian Pek-Dorji is the founder Executive Director of the Bhutan Centre for Media and Democracy. She is a print and broadcast journalist. 1 Koh Buck Song, Brand Singapore: How Nation Branding Built Asia’s Leading Global City. Marshall Cavendish, Singapore, 2011.